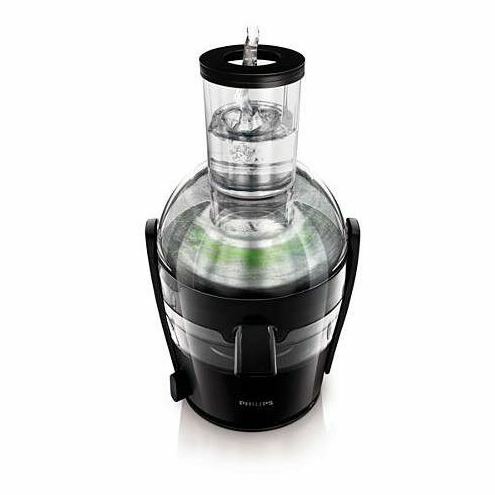 This Philips juicer extracts even more juice from your fruits and vegetables. Cleaning can be done within 1 minute thanks to the revolutionary ” QuickClean” technology. Treat yourself with the joy og healthy homemade juice every day! 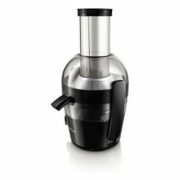 Easy checking of the pulp with see-through pulp container Enjoy a true interactive juicing experience. The lid and the pulp container are transparent so you can see your fruits and vegetables being juiced. You also directly see when the container is full which means it is time to empty it. 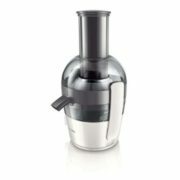 Juice up to 2L in one go You can make up to 2L of juice in one go without needing to empty the pulp container. Powerful 700 W motor Strong 700 W motor for blending, mixing and crushing effectively. 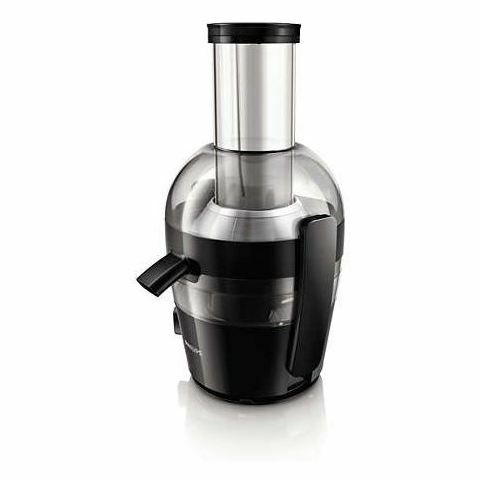 QuickClean technology The Philips juicer is designed for easy cleaning thanks to QuickClean technology. Cleaning can now be done within 1 minute, thanks to the integrated pulp container and smooth surfaces. All pulp collected in one place for easy disposal The pulp will all be collected in the only place where it should be: in the pulp container of your Philips juicer. That means there is no need to remove pulp from other parts such as the lid anymore. Due to the round design and smooth surfaces without nooks and crannies, the pulp is easy to reach and the container is much easier to clean. Quick Clean sieve A lot of pulp fibres usually get stuck in the sieve, which makes it very difficult to clean. 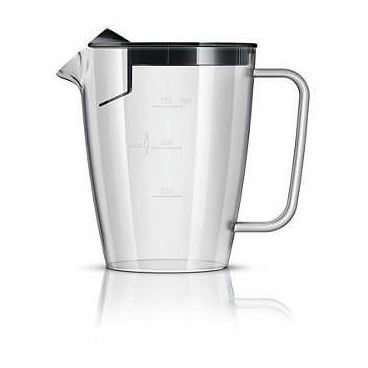 Thanks to the innovative QuickClean technology all surfaces of the sieve are smooth, which helps you wipe away the fibres with a standard kitchen sponge. 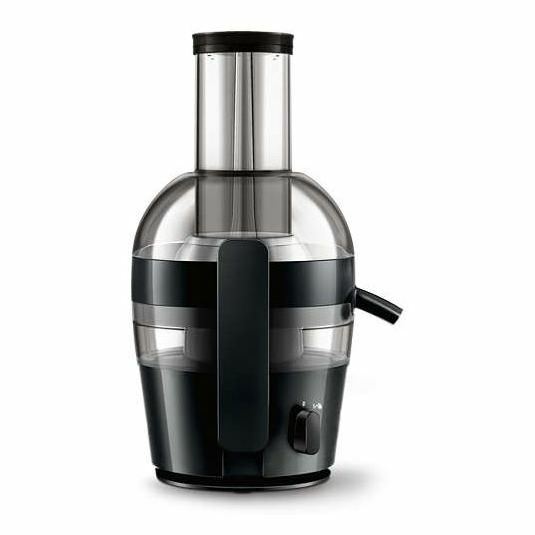 Pre-clean function rinses away the unwanted fibers The Philips juicer is the 1st centrifugal juicer on the market with a pre-clean function. 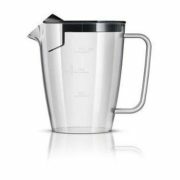 By pouring water in the pusher, you can create a water fountain in the appliance, which rinses away the unwanted fibers from the lid and makes the sieve easier to clean.